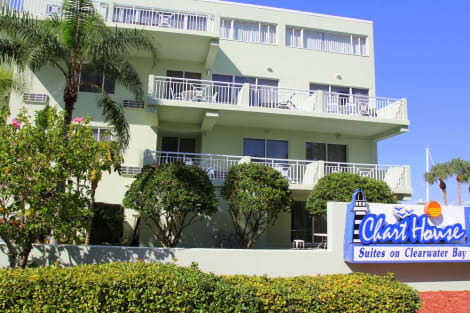 When you stay at Seaside Inn & Suites in Clearwater Beach, you'll be on the beach, just steps from Beach Walk and 10 minutes by foot from Pier 60 Park. This beach hotel is 1.5 mi (2.4 km) from Clearwater Marine Aquarium and 2.2 mi (3.6 km) from Sand Key Park. With a stay at Shephards Beach Resort in Clearwater Beach, you'll be on the beach, just steps from Captain Blighs Landing and a 4-minute drive from Clearwater Municipal Marina. This beach resort is 0.9 mi (1.4 km) from Pier 60 Park and 1.7 mi (2.8 km) from Clearwater Marine Aquarium. Grab a bite at Barista, one of the hotel's 3 restaurants, or stay in and take advantage of the 24-hour room service. Snacks are also available at the coffee shop/café. Relax with your favorite drink at the bar/lounge or the poolside bar. Full breakfasts are available daily for a fee. The Sandpearl Spa is a haven of serenity and natural beauty for those seeking to relax, restore and rejuvenate the body, mind and spirit. The spa provides over 50 spa services, including water therapy, inspired by the tranquil waters of the Gulf Coast; touch therapy; spa rituals, including the signature Essence of Sandpearl treatment; skin care and salon services. 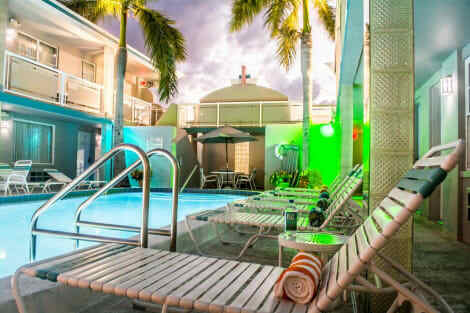 Located opposite the beach, Beachwalk Inn boasts a Gulf of Mexico view, free WiFi, and an outdoor pool. Free morning coffee, a daily maid service, and laundry facilities are available on site. Guest rooms at the Beachwalk Inn are equipped with a cable TV, microwave, and small refrigerator. Some rooms feature a kitchenette. Pier 60 is a 15-minute walk from the Beachwalk Inn. Caledesi Island State Park is less than 5 miles from the motel. Enjoy recreation amenities such as an outdoor pool or take in the view from a rooftop terrace. Additional amenities at this Art Deco hotel include complimentary wireless Internet access, wedding services, and a picnic area. Make yourself at home in one of the 64 air-conditioned guestrooms. Complimentary wireless Internet access keeps you connected, and cable programming is available for your entertainment. Private bathrooms with bathtubs or showers feature complimentary toiletries and hair dryers. Conveniences include safes and coffee/tea makers, as well as phones with free local calls. Relax on the private beach or enjoy other recreational amenities such as an outdoor pool and a spa tub. This hotel also features complimentary wireless Internet access and a television in a common area. 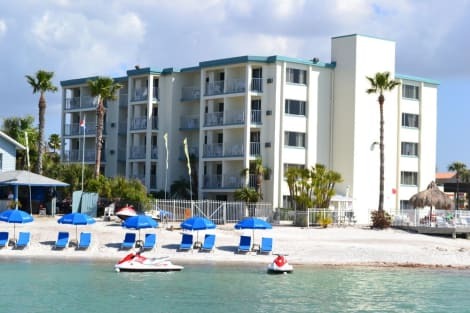 When you stay at Chart House Suites on Clearwater Bay in Clearwater Beach, you'll be near the bay, a 3-minute drive from Beach Walk and 6 minutes from Sand Key Park. 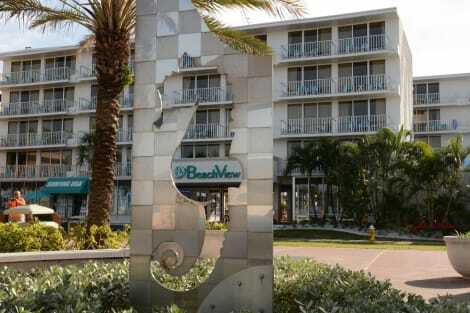 This hotel is 1.3 mi (2.1 km) from Pier 60 Park and 2.2 mi (3.5 km) from Clearwater Marine Aquarium. 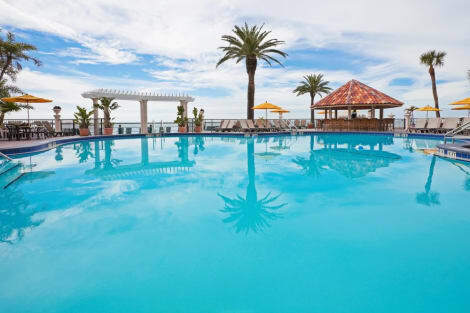 lastminute.com has a fantastic range of hotels in Clearwater Beach, with everything from cheap hotels to luxurious five star accommodation available. We like to live up to our last minute name so remember you can book any one of our excellent Clearwater Beach hotels up until midnight and stay the same night.